It’s not just Christchurch City that has seen exciting new cycling developments in the region. Nearest neighbours Selwyn District have also been investing in new cycling facilities. As part of the Govt’s Urban Cycleways “quick start” projects, a new off-road pathway connecting Rolleston and Lincoln was approved last December, at a cost of $850,000. Last month the 8.6km route was completed and officially opened; I’d had a chance to get out and have a look at it a month earlier when it was about half complete. The District’s first major foray into cycling provision was in the development of the Christchurch – Little River Rail Trail, much of it running within its boundaries. This has been progressively developed in stages since 2006; in fact the last little bit into Little River is currently out for consultation by CCC. As well being a great asset for recreational riding, the Rail Trail route also provides a handy way to get from Chch out to Prebbleton and Lincoln separated from passing traffic. Another pathway from Lincoln to neighbouring Springston was also completed last April. The new pathway provides another handy link, connecting the fast growing areas of Lincoln and Rolleston. Again, the route simply runs alongside the roads between these towns, using the generous shoulders available. The path is currently only 1.5m wide in the rural sections, which has caused concerns from some quarters. But it has to be remembered that this is hardly likely to attract the same kind of demand from riders (and walkers) that we are seeing in Christchurch. The nature of the terrain means that it would be relatively easy to come back and widen much of it at a later date if it became very popular. One section (approaching Selwyn Rd) makes use of a no-exit road to provide a link through, while motorists have to go around the long way. While generally built to a good standard, I did think that the couple of places where the pathway crosses the adjacent road were rather unnecessarily sharp corners. Bikes can’t turn on a dime, so it’s nice if the geometry acknowledges this. It’s not just pathways for cycling that are being looked at by Selwyn District. For example, they are currently consulting on future options for Reid’s Pit, an old quarry halfway along the Rolleston-Lincoln route. Possible ideas could include walking trails, a mountain bike track, or picnic areas. And already there are a lot of fun recreational biking routes around the District. Selwyn District is the fastest growing area in New Zealand, putting a lot of pressure on infrastructure like transport. So it’s an opportune time to be considering how to ensure that cycling is a viable option, both within and between Selwyn’s townships. And there’s more planned for the District in the future too. Have you tried the new Lincoln-Rolleston route? What do you think? I did the Springston bit about two weeks ago – was a nice ride with an awesome tailwind on the way back. Do watch out for quad bikes though. 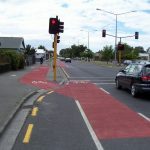 Anyone know where to find details for a safe cycle route from Prebbleton into Christchurch CBD? How do you get from Prebbleton to the end of cycleway along the new southern motorway? Take the Little River Trail to Shands Rd and then to the shared pathway at Halswell Junction towards the motorway. Not ideal though; a better connection will be provided when Stage 2 of the motorway extends towards Rolleston. Thanks. I’ll check it out as it might become my year round commuter route if I move house.